IFC can’t get enough of Baroness von Sketch Show. Today, the network announced they’ve renewed the TV show for a fourth season. The all-female comedy sketch series is performed and written by Carolyn Taylor, Meredith MacNeill, Aurora Browne, and Jennifer Whalen. Season three of Baroness von Sketch Show debuts on IFC on November 8th at 9 p.m. ET/PT. NEW YORK – August 23, 2018 – IFC announced today that it has picked up the upcoming fourth season of the all-female sketch series Baroness von Sketch Show which will air on the network in 2019. The series is performed and written by Carolyn Taylor, Meredith MacNeill, Aurora Browne and Jennifer Whalen. Whalen also serves as the season’s showrunner. Season 3 of the series will premiere on IFC Thursday, November 8 at 9PM with two back to back episodes. The remaining episodes of the 10-episode third season will air weekly, with episodes airing two at a time Thursdays starting at 9PM. 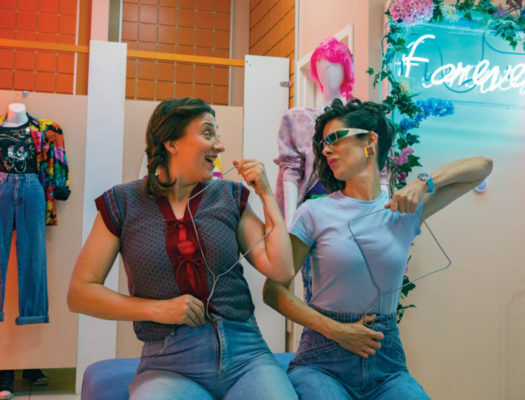 Originally airing on Canada’s public broadcaster, CBC, and produced by Frantic Films, IFC acquired Seasons 1 and 2 of Baroness von Sketch Show from Banijay Rights and debuted both seasons last summer to strong critical acclaim. Hailed as “fabulous” by The New York Times and “the best thing to come out of Canada since Ryan Gosling” by Vogue, Baroness von Sketch Show provides an insightful, satirical look at our everyday modern lives. Fast-paced and irreverent, the female-driven sketch comedy series celebrates the absurd and mines the embarrassing, offering a fresh, witty take on relatable moments such as crying at work, waiting in airport security lines, dealing with gossip-obsessed co-workers, co-parenting and more. The series recently was awarded “Best Sketch Comedy Program or Series” at the 2018 Canadian Screen Awards. Baroness von Sketch Show is executive produced by Jamie Brown, Taylor, MacNeill, Browne and Whalen. Taylor served as showrunner for the series’ first three seasons. The series is produced by Frantic Films and originates on CBC in Canada. It is distributed internationally by Banijay Rights. Season 3 will premiere in Canada on CBC, the CBC TV streaming app and cbc.ca/watch on Tuesday, September 18 at 9PM (9:30NT). Season 4 is set to begin production in Toronto in the coming month. What do you think? Have you seen Baroness von Sketch Show? Are you glad it’s been renewed? More about: Baroness von Sketch Show, Baroness von Sketch Show: canceled or renewed?, IFC TV shows: canceled or renewed? I am so happy that the Baroness Von Sketch show has been renewed for two more seasons! I loved this show from the first episode! I am hooked! !